The Master Negotiator will answer all your questions concerning negotiations! 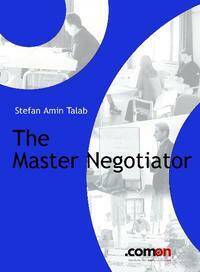 The Master Negotiator summarizes and structures clearly, concisely, and coherently the experience, skill and know-how of thousands of negotiators from all over Europe, the Middle East and the United States. Winning negotiation strategies and negotiation strengths are clearly described helping you to find your way through the negotiation jungle and avoid typical traps when pursuing your interests. This guidebook gives you tips &amp; ideas for all sorts of negotiations, whether they take place with family members, employers or business partners. It is based on practical experience and explains the theoretical background in a succinct and easy-to-understand manner. Numerous examples illustrate what an efficient preparation should entail, the diverse negotiation types that can be employed and a list of successful strategies and tactics. What strategy should you choose if you are buying a used car? How should you deal with a shark type negotiator? How is the SMART formula helping you to set optimal negotiation objectives? What should your answer be to a negotiator starting with: "I heard your service is really bad." and what would you reply to "This is way too expensive!" Which is the best way to counter the "low-hanging-fruit" tactic? The "Negotiation Master" will give you answers to all your questions concerning negotiations: The Negotiation Master summarises and structures clearly, concisely, and coherently the experience, skill and know-how of thousands of negotiators from all over Europe, the Middle East and the United States. Winning negotiation strategies and negotiation strengths are clearly described helping you to find your way through the negotiation jungle and avoid typical traps when pursuing your interests. This guidebook gives you tips &amp; ideas for all sorts of negotiations, whether they take place with family members, employers or business partners. It is based on practical experience and explains the theoretical background in a succinct and easy-to-understand manner. Numerous examples illustrate what an efficient preparation should entail, the diverse negotiation types that can be employed and a list of successful strategies and tactics.